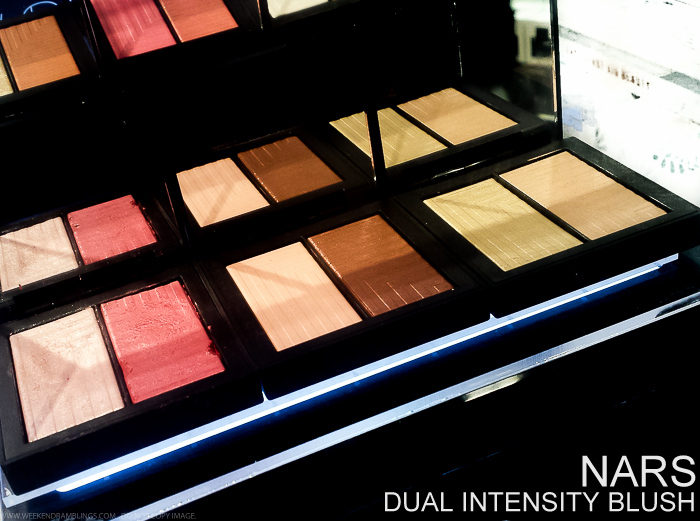 NARS Dual-Intensity blushes launched a while back but they turned up on display at my local Sephora only recently, hence the delayed swatches over here. The regular NARS blushes are quite raved about among makeup addicts, so I was quite curious to try out these newer dual-intensity blushes and see if they were anything similar. Each blush compact features 2 different shades, and the 6 available, it's easy to find a blush or two for any skin tone. The formula feels light and easy to blend - it's powder that feels almost creamy smooth - and the shimmer blends into the skin giving a beautiful glow more than chunky particles of glitter. Scroll on for swatches. I amn't a heavy makeup person,but I love blushes and own more than I can ever use up in a lifetime. I know given a chance I would easily buy a dozen more, so I really appreciate the design of these blushes - 2 smaller blushes in one compact rather than one huge pan of blush which I will have to throw away barely used some day. 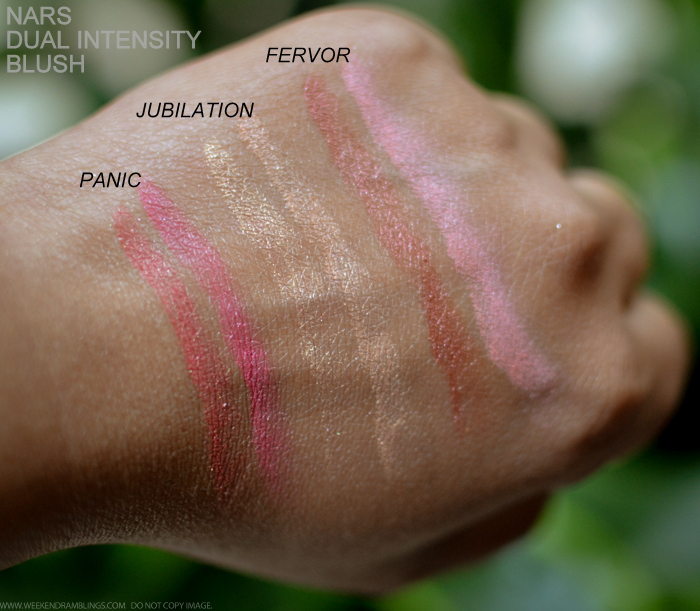 I love the formula of the NARS Dual-Intensity blushes c- swatched dry - but like a lot of the wet/dry products, I doubt if I will ever use these wet. I am sure these will turn out a lot more intense when used wet, but I feel moisture will cause these products to expire faster - just my opinion...I could be wrong. Anyway, for now my favorite among these is Panic - shimmering shocking fuchsia/shimmering orange-pink, both of which would show up beautifully on my darker Indian skin tone (even when used dry).